In the weeks and months to come, I hope this blog note will serve all Type 4 Buy and Hold Investors by helping them stay on the right side of the Market, just as earlier blog notes did when it was time to exit back in 2007 and 2008, and then come back in 2009. 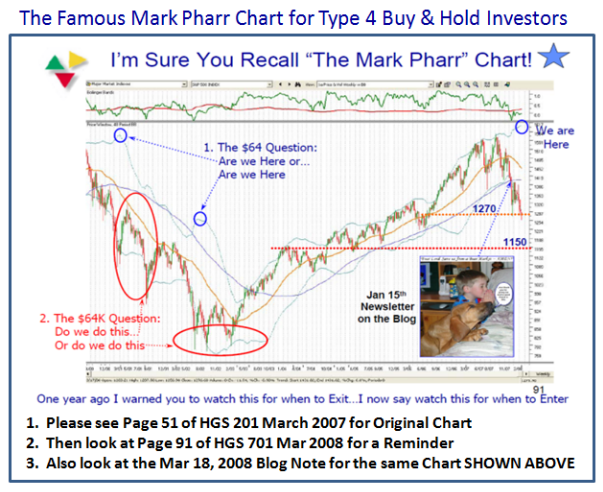 Question: Could someone tell me how Type 4 investors should use Ian’s Mark Pharr Chart view? Ah Bill…I sense the Type 4 Buy and Hold Investors are getting a trifle fidgety and want to have their ducks lined up for a proper exit! 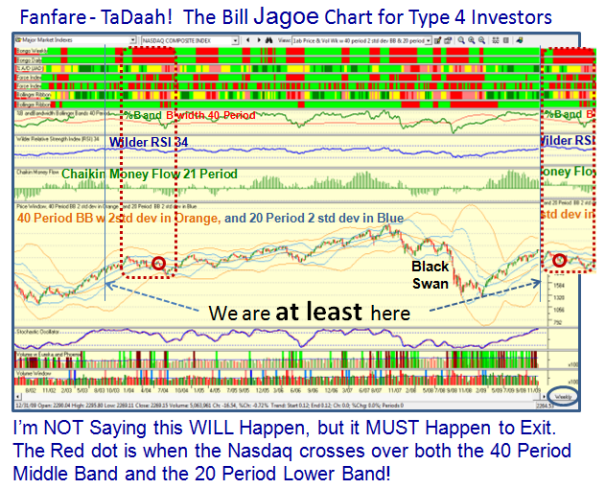 You are in luck, as not only will I cover the Mark Pharr Chart but also the Bill Jagoe Chart as I will elevate you to the peerage in the History of Using Bollinger Bands (BB’s) for Type 4’s. Here is a full explanation as promised in my bb note to you. 1. A Large drop in %B of the BB’s of > -0.24, at least a small Kahuna down. It happened. 2. A drop below a reading of 0.60 in %B…it happened. 3. A hold at a %B of 0.3 or it dies. It died. 4. The %B breaks down through the Bandwidth. It did. 5. An ultimate drop of >10%. We wish it was only 10%, but that was the first drop back in 2007-08. 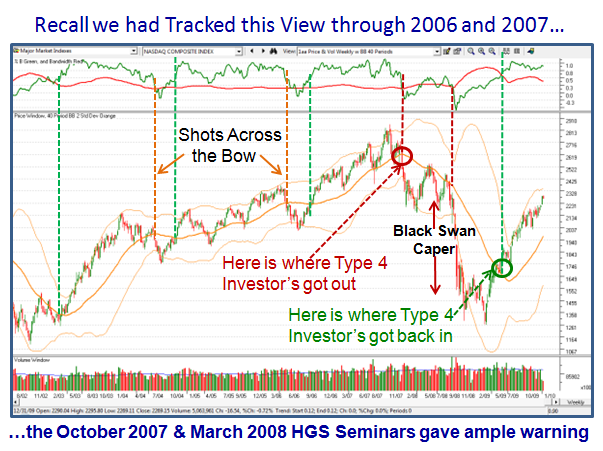 The HGSI Software has given us substantially more visibility since then and here is an updated view of a chart that used both a very long term 89 Periods along with the 40 Period as shown below. Note I have added the famous Ribbons of Green and Red, which you will be able to use with fast response once the next release is out…which will be very soon. For now, it doesn’t take a minute to visually see the “Days of Wine and Roses” in 2003 to early 2004 which is highlighted in the green dotted frame, just as we have right now, with the points of entry back then and more recently in July of 2009. 1. ALWAYS, I repeat ALWAYS, trust %B going up or coming down through the Bandwidth as your PRIME Target for when to enter or exit. Note that on a 40 Period Weekly chart the %B is currently at 0.8937 and the Bandwidth is at 0.3923, so at this time you have plenty of cushion before the %B comes down through the Bandwidth. 2. The second Golden Rule is that 77% of the time over 50 Years, the S&P 500 has corrected <8%; it is 70% for the Nasdaq. So as a Type 4 Investor if you are prepared to take a chance that you have roughly 3 chances out of 4 that you will not lose more than 8%, then that is the second trigger. More than that and you kiss it goodbye. Otherwise you know the rest of the sad story having been through 2000-03 and 2007-2009, along with the rest of us. It hurts when you lose an Intermediate Correction of 12% to 16%, and worse yet, a Bear Market Correction of >20%. Your own Portfolio will be substantially worse than these numbers! 3. The advance warning for both of the above to occur is that BONGO WEEKLY will turn Red…thanks to the team of five HGSI Users who did stalwart work on the Bongo Indicators. Bongo Weekly is slow to turn, so remember it is a godsend for Type 4 Investors, who are reluctant to be jack-in-the-box Investors and are prepared to give up some of their Profits until their stomachs can’t stand it any more! 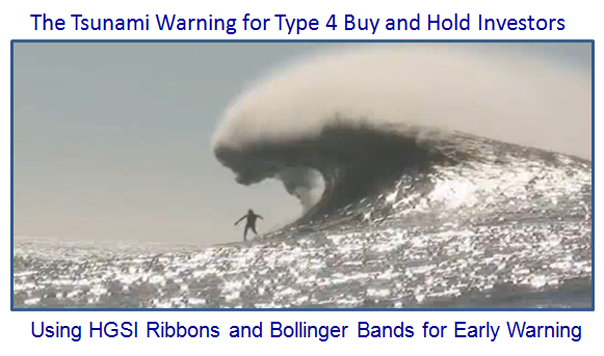 However, given that the two patterns are similar at this stage of events, it would pay for Type 1, 2 and 3’s to also watch for a heads up on the Weekly Bongo turning Red, as that is a significant event that should not be taken lightly. 4. By then, all the Ribbons on the “wc chart” will be blood red, and you will be sporting a score of -5 or worse, especially if we have a sharp jolt with a Phoenix and Red Kahuna down (> -0.40). 5. The Slow Stochastics shown on that View will break 80 and then 60 in a hurry. It is currently at 99.55…highest yet in six years. However, note how it stays up for very long periods and it takes a lot of deterioration on all the other items before it snaps. 6. Wilder RSI will break 50 to the downside. It is currently at 58.32 with the Nasdaq Weekly view. 7. 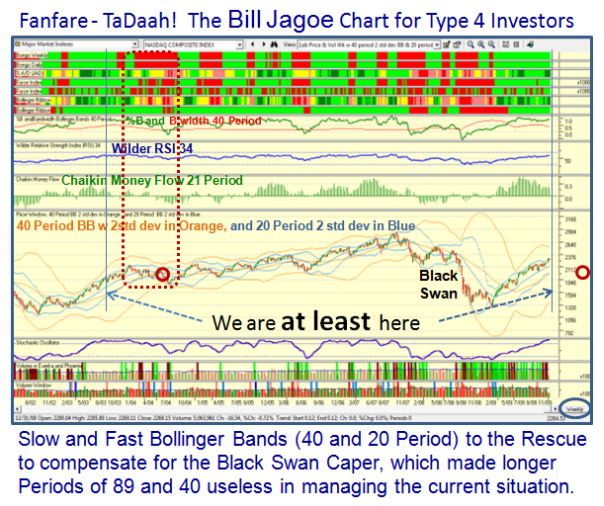 I promised you a Bill Jagoe Chart which will elevate you to the peerage along with Mark Pharr in the annals of using Bollinger Bands. After much soul searching, the problem we have with the current long term BB’s of 40 and 89 Periods is the “Black Swan Caper”, rendering it too loose to give sufficient warning EARLY enough, should things go south in a hurry. 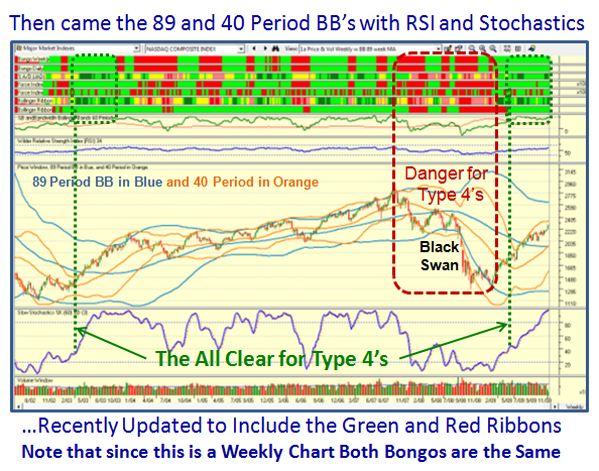 So, I offer you the 40 and 20 Period BB’s which bring both the Middle Band of the 40 Period and the Lower Band of the 20 Period together and that coupled with the Nasdaq crossing down through them would suggest the party is over…at least for a 10% correction if not more. These are currently at 1966 and 1981 with the Nasdaq Index at 2269 on a Weekly Chart, while the Middle Band for the 20 Period is at 2132. By now you know my process well enough that I’m NOT Saying this WILL Happen, but it MUST Happen to Exit. The Red dot is when the Nasdaq crosses over both the 40 Period Middle Band and the 20 Period Lower Band by using the old trick I have taught you to overlay past history from 2004 on the current chart as shown in the next two slides! a. Given the natural tendency for Bulls and Bears to always hold or break at even numbers, the battle will be first fought at 2200 which is only 3% below the current Close. b. If that is broken, expect the next battle at 2132, which is 6% down. c. The last resort will be around 2000, or essentially 12% down. Obviously in the scheme of things, the first two targets are tolerable to a a Long Term Type 4 Investor, and I am sure they will start to scratch their heads at 2100, which is 7.5% down. The rest depends on individual stomachs for Risk/Reward tolerance and proper Money Management. 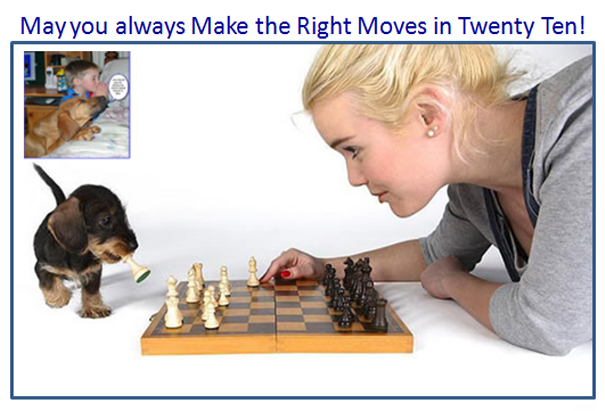 This entry was posted on Saturday, January 2nd, 2010 at 10:03 pm	and is filed under HGS Principles, Market Analysis. You can follow any responses to this entry through the RSS 2.0 feed. Both comments and pings are currently closed.